The 25-year-old singer is accused at Guildford Crown Court of affray, two charges of common assault and one of assault by beating. 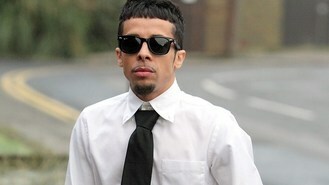 Dappy, charged under his real name of Costadinos Contostavlos, is on trial alongside Kieran Vassell, 25, of Hammersmith, west London, and Kalonji Stewart, 32, of Harborne, Birmingham, who both face a single charge of affray. The case relates to a fight which broke out at a Guildford petrol station in the early hours of February 28 last year, leaving three men with facial injuries.